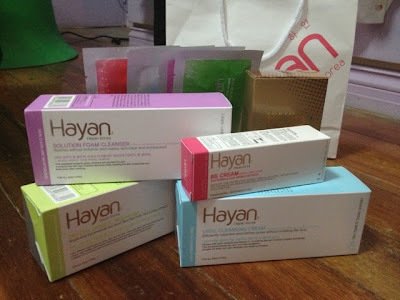 Hayan Korea Cosmetics Haul | Vanity and Everything in Between. I've been seeing posts about Hayan Korea Cosmetics almost everywhere and I was shocked to find out that it's been in Manila for more then one year now. I was like, "what? 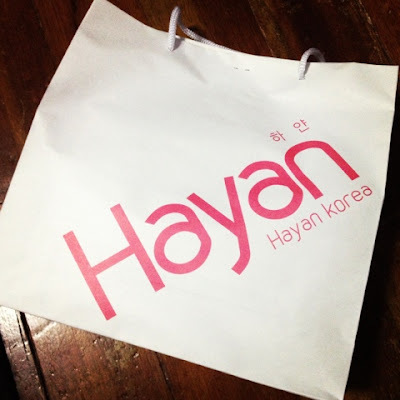 Where can I find Hayan?" Well, the nearest branch to me is in Starmall EDSA. So, one day, I decided to brave that mall and see what the fuss was all about. Their shop is not your typical Korean makeup store. To begin with, they don't have fancy and girly designs. The store is just plain white and their products are simply displayed. Talk about minimalism. Another reason why I have been wanting to visit their store is that their prices are currently up to 70% off. Think of it as an introductory price. There's no definite date when they will put the regular prices back. So better buy now while it's on sale, right? I got myself a foam cleanser - PhP147.00, cleansing cream (makeup remover) - PhP147.00, BB cream - PhP234.00, and their peeling gel (PhP234.00) that is similar to Cure Aqua gel. I also got myself 4 face masks at PhP15.00 each! So, if you have the time, visit their branch near you while they are still on their introductory price! Review on these products soon! Sige ako gagawa pero parang difficult to make a review on it!